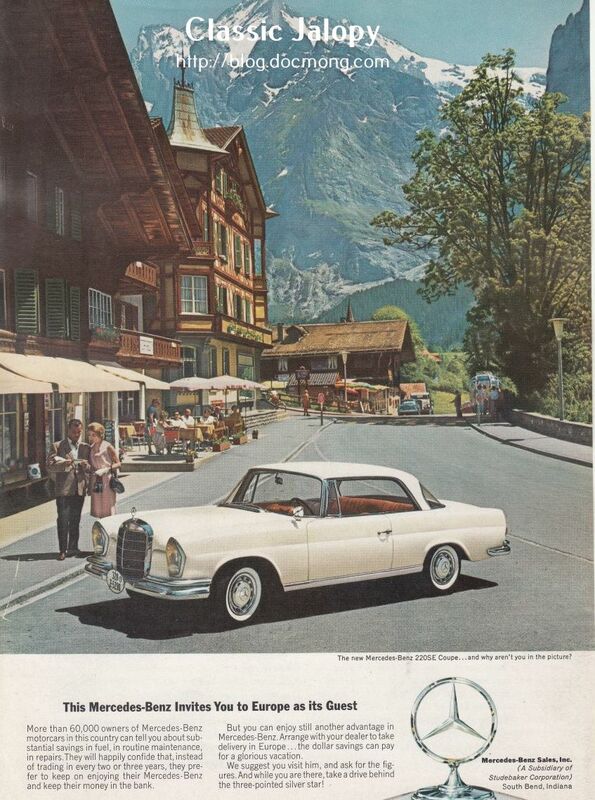 This weeks ad has a great photo of the W111 Coupe. While this car is a 220SE, it looks very similar to the 250SE that I used to have – this car has a red interior and mine had a red wine coloured one, but they look similar. It also wears the zoll plate for European delivery programme. This Mercedes-Benz Invites You to Europe as its Guest. More than 60,000 owners of Mercedes-Benz motorcars in this country can tell you about substantial savings in fuel, routine maintenance, in repairs. They will happily confide that, instead of trading in every two or three years, they prefer to keep on enjoying their Mercedes-Benz and keep their money in the bank. But you can enjoy another advantage in Mercedes-Benz. Arrange with your dealer to take delivery in Europe… The dollar savings can pay for a glorious vacation. We suggest you visit him, and ask for the figures. And while you are there, take a drive behind the three-pointed silver star!